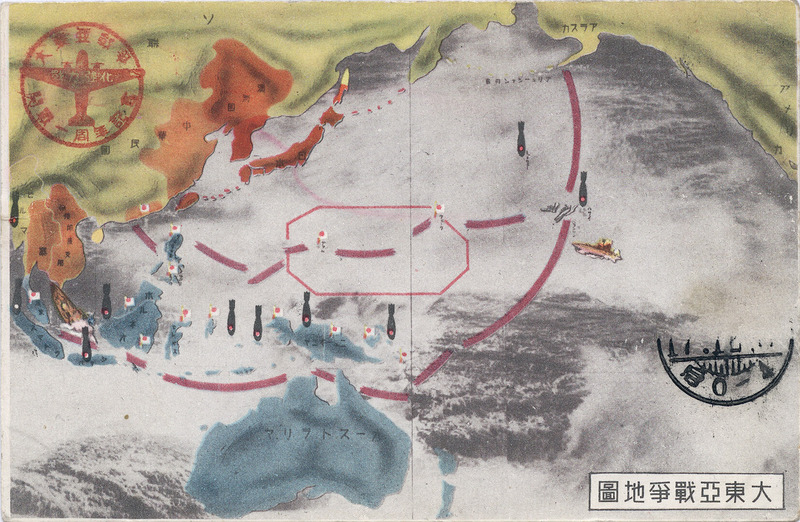 “Greater East Asia Co-Prosperity Sphere” [Dai Tōa Kyōeiken] propaganda postcard, 1942, mapping the member territories and early Pacific War attacks and territorial gains against the ABCD powers (American, British, Chinese, and Dutch) in the early months of the war. The co-prosperity sphere was a pan-Asian concept created and promulgated by the Empire of Japan from 1930 to 1945 for occupied Asian populations. It promoted the cultural and economic unity of East Asians, Southeast Asians, South Asians and Oceanians against Western imperialism but was, itself, an example of Japanese imperialism. “Solid nation union to sail in rough sea” propaganda postcard, c. 1940. “[T]he staff officers who had been wandering around the halls of peace at IGHQ [Imperial General Headquarters], the top advisors who fumbled the ball when given the chance for peace, as well as the emperor himself, all for the sake of insufficient material capabilities, were at once intoxicated by the dramatic reports of the first strikes [on 8 December against the US, Britain, and the Dutch East Indies] and at the same time struck with amnesia about how hesitant they had been in the past. The majority of the Japanese people as well went crazy over the Empire’s initial victories, without a clue as to why their generals, being aware of how reckless such a venture was, had plunged them into war.